CATCHING AIR: Lance Clark with the UAV that the DMA department owns. The digital media arts department has decided to look further into the option of having a UAV, or unmanned aerial vehicle, certification program on campus, which will be available for any student to partake in. An unknown arial vehicle allows one to film or photograph from the air without being present in the craft. The idea of the certification arose when the department started doing research about the process and having discussion about the new agriculture program that was being added to the university. 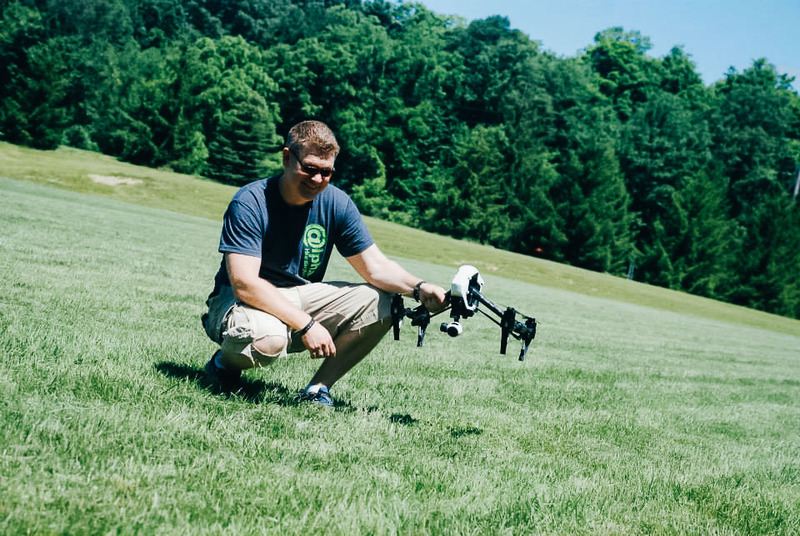 They weighed the pros of what UAV certification has in the video world and the agricultural world, such as helping students gain experience with UAV they can note on their resumes in those specific fields. The class itself will be more broad and will cover the basics of flight, what UAVs are doing and what they might do in the future. The certification process will consist of three main phases. The first phase will be ground school, where students will need to take a test on numerous elements from a textbook. Once the students have passed the test, they will move onto phase two, the simulation. “We have a program and a remote control simulations, so we’ll expect students to log hours on our simulator,” Hartman said. Once the student has logged a total of ten plus hours using the hands-on simulator, they will need to check off those hours with the professor, and will move to the third phase of the process, flying the UAV. “You will have specific UAV tests – how to fly and stuff, but that’s more to get people used to it and give them experience,” Hartman said. The tests will not be super difficult, and will involve the student navigating the UAV through safety cones and different aspects of that nature. “It’s not like if you crash you’re going to fail, but you definitely have to take the hands-on training,” Hartman said. Once the student completes the third and final stage, they will earn their UAV certificate, however this is not a license and will not allow that student to freely fly a UAV or fly commercially. In order to do that, one must have the approval of FAA (Federal Aviation Administration). “This is a certification program in three steps that will allow students to put that on their resume and maybe get a boost compared to their competitors in the field,” Hartman said. Junior Payton Dorothy thinks the department certification program is a good idea, but does not think it is necessary for the department to use their resources to purchase a UAV at this time. Though he is graduating in May, senior Henry Maynard thinks the opportunity of UAV certification will be a good asset to the department. The university would like to eventually open up the certification program to not only students, but those outside of the university as well. Right now, however, the department is focusing solely on making sure the students have this opportunity. NOTE: An earlier version of this article referred to UAV as an “Unknown Aerial Vehicle.” It has since been corrected to read “Unmanned Aerial Vehicle.” We apologize for the misprint.